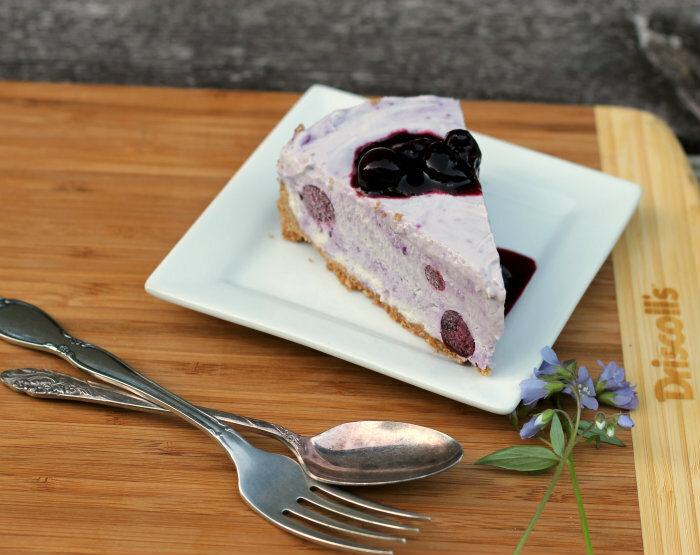 Frozen blueberry cheesecake with roasted blueberry topping. Disclaimer: Driscoll’s gave me coupons to purchase berries and I was given a compensation to purchase other ingredients for this dessert. But as always my writings and opinions are all mine. I hope everyone had a wonderful Memorial Day. Mine was spent with family remembering the family members that have passed. We don’t have anyone in our family that has past due to fighting in the military, but we do honor family members that have passed before us. Memorial Day always means making a trip to the cemetery to put flower on the graves of loved ones and saying a pray or two in honor of them. It has been a tradition for many many years. Also Memorial Days means the beginning of summer. Which means summer berries, such as blueberries. Which means summer desserts. And by the way did you know that May 26th, Tuesday (which is tomorrow) is National Blueberry Cheesecake Day? I decided to honor this day with a non-traditional blueberry cheesecake, frozen desserts are always a hit with my family so I decided to make a frozen cheesecake. I baked my crust for this dessert, but it is a step that you can omit if you like, which would mean that there would be no oven involved. Perfect for when the summer months have heated up and you don’t want to turn on the oven. 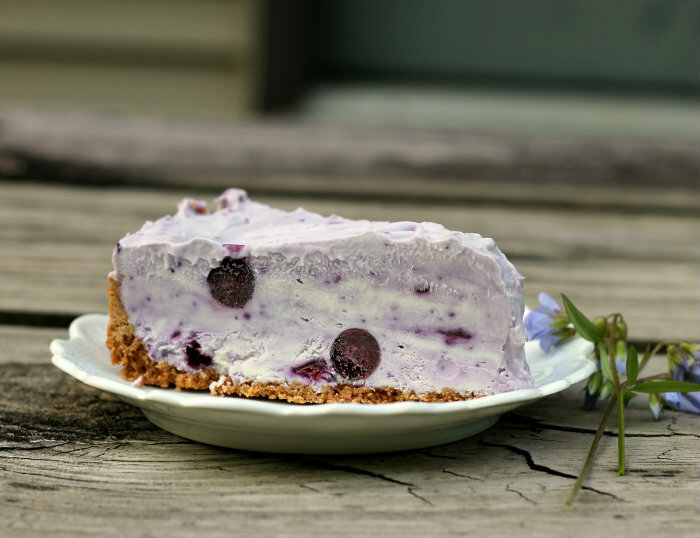 The dessert is smooth and creamy with a tang from the cream cheese and the sweetness of the blueberries, it was a hit with my family and it will be for sure a hit with your family too. 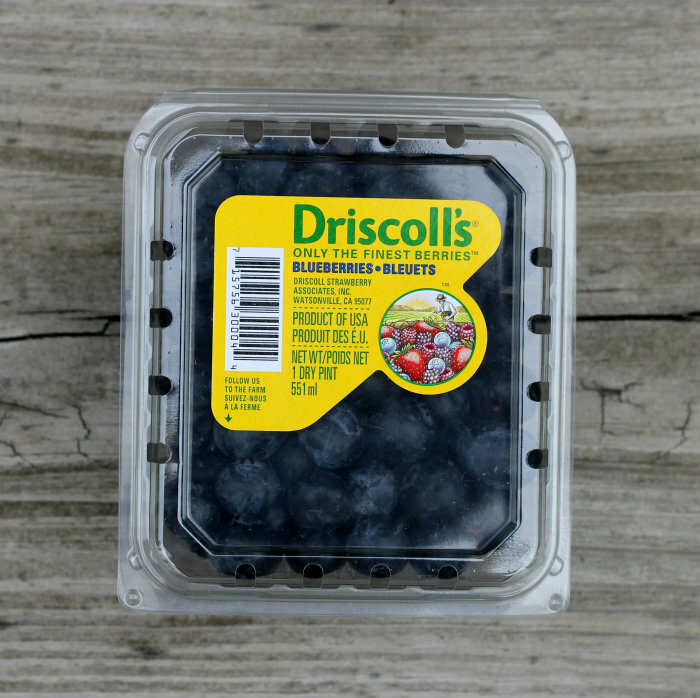 If you haven’t tried Driscoll ‘s berries you really need to go to your grocery store and pick up a pint or two. They are known for their strawberries, raspberries, blackberries, and yes blueberries. 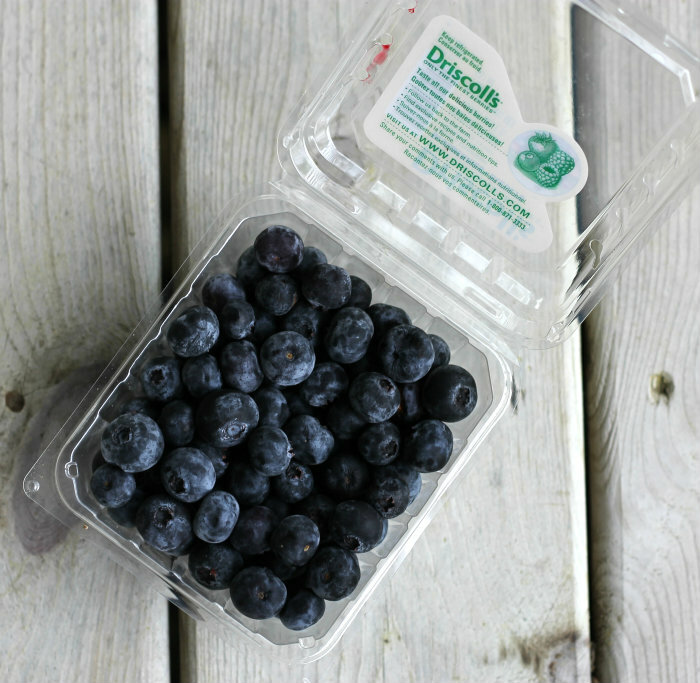 Their berries are always plump, juicy, and let’s not forget packed with vitamins, antioxidants, fiber, and list goes on . The blueberries that I purchased were ripe and sweet, which definitely made this frozen blueberry so yummy. Visit Driscoll’s site for more recipe ideas and coupons here. Crust- Combine graham crackers, sugar, cinnamon and mix well. Add the melted butter and combine. Press into a 9-inch spring-form pan. Bake in a 375 degree F preheated oven for 6 minutes or if not baking set in the refrigerator for 30 minutes. Filling- In a small sauce pan combine the sugar and corn starch, gradually whisk in the water until smooth. Add the berries, lemon juice, and zest. Over medium heat and cook blueberries just until they start to thicken about 5 to 6 minutes. Some of the berries will break down, but some will stay whole. Remove from heat and cool completely. Add the cream cheese to a large bowl and beat with an electric mixture until creamy add the sweetened condense milk and beat until combined. In another bowl add a cup of whipping cream and beat until there stiff peak add the vanilla and beat until combined. Fold the whipped cream into the cream cheese mixture until combined. Add the cooled blueberries to the cream cheese mixture and fold in. You will fold the mixture until the blueberries are just about folded in, leaving some of the cream cheese so it is not completely mixed in. Pour into the graham cracker crust.Cover with aluminum foil and place in the freezer for at least 8 hours or overnight. Blueberry topping- Toss blueberries with sugar, place the berries on a baking pan (such as a jelly roll pan). Place the berries in a preheated 400 degree F oven for about 8 to 10 minutes or just as the berries start to release their juices. Cool completely. Serving- Remove the cheesecake from the freezer and let set for about 5 to 15 minutes before cutting. Top with roasted berries and sweetened whipped cream. This look delicious! I love blueberries! Driscoll’s berries are great. And who doesn’t love cheesecake? Put them together — instant yum! Thanks for this. 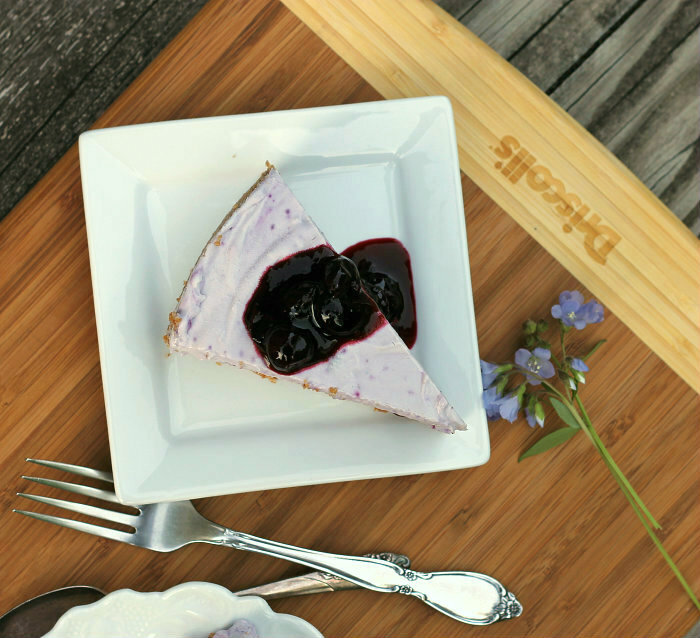 Love fresh blueberries (just bought a ton of them) and I love cheesecake so this recipe is perfect for me. Blueberry cheesecake is one of my absolute favorites! I never had a frozen one – this looks delectable Dawn! And yay! I’m so glad you added the social sharing buttons! They look great. Oh my goodness this looks great. 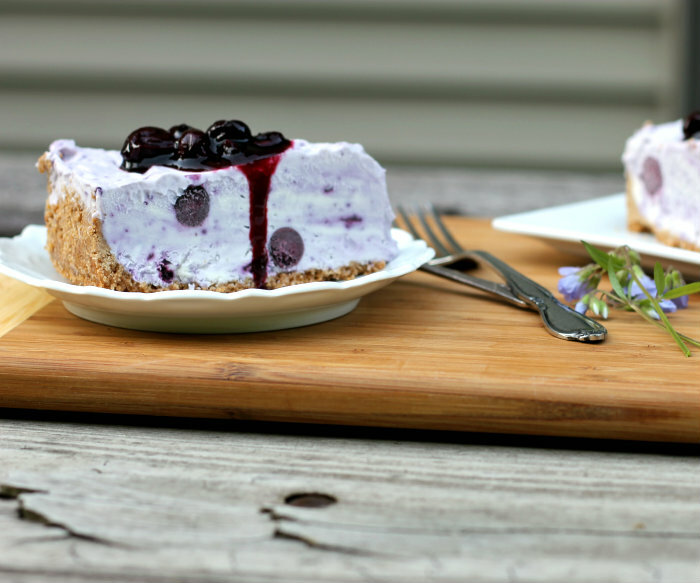 I love blueberries and can’t believe I’ve never tried them in a cheesecake before! Thank you for linking up with us for Fabulous Foodie Fridays, I hope you have a great weekend.